Another week has passed, and it is time to get this column on its way. Last Friday around 8:30 a.m. sisters Verena and Susan; sister Emma and her husband Jacob; and my husband, Joe, and I hired a driver with a minivan to take us to Lafayette, Ind., to Uncle Andy’s funeral. It took us more than three hours of driving time each way. All but two of Dad’s eight siblings made it to the funeral. Dad came from a family of three girls and ten boys, but eight of the boys are left now. It is sad to see the group of siblings get smaller. It was 7:30 p.m. until we made it back home safe and sound. Baptismal church services were held at Emma and Jacob’s house on Sunday to take in two young souls as members. The services were held in a big pole barn. As baptismal church services are usually bigger in attendance, another bench wagon was borrowed from a neighboring district. 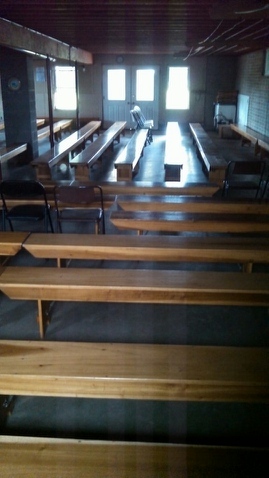 Amish baptism services are larger than normal church services, so extra benches like these are brought on the bench wagon to the house or barn where the special church service will be held. There were a lot of people to serve lunch to, but we had plenty of everything. Sixty-four loaves of white and wheat bread were brought in. Also on the menu were bologna, cheese spread, peanut butter spread, freezer pickles, dill pickles, pickled red beets, sliced tomatoes, strawberry jam, butter, coffee, and iced tea. 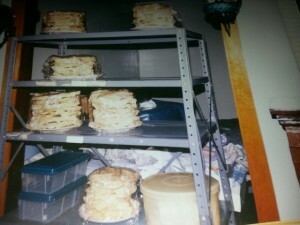 There were also various kinds of cookies, such as sugar, oatmeal, chocolate chip, and chocolate crinkles. Some of the church families and the youth were invited back for supper and singing. We had a haystack meal. A haystack is a variety of vegetables, toppings, and hamburger with taco seasoning. 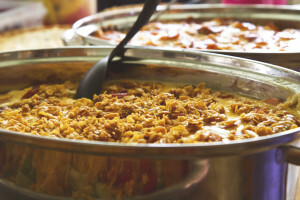 Sister Emma’s version consisted of layers of crushed Saltine crackers, hamburger, rice, shredded lettuce, diced tomatoes, chopped green peppers and onions, crushed tortilla chips, cheese sauce, and salsa. Dessert was a fresh fruit mixture of watermelon, muskmelon, grapes, and apples, as well as M&M bars, peanut butter swirl bars, Jell-O cake, and ice cream. Daughters Elizabeth, 20, and Susan, 18, didn’t have work at the factory this week. Elizabeth is sewing her dress, cape, and apron and Timothy’s shirt for niece Elizabeth’s wedding in Berne, Ind., next week. Timothy and Elizabeth will be table waiters at the wedding. Daughter Verena, 16, will also be a table waiter at the wedding. I have her dress suit (the dress, cape, and apron) cut out but still need to sew it. The color they will wear is raspberry. I will help cook and need to wear a burgundy-colored dress suit. I still need to cut them out. It seems the weeks slip by so fast, and the wedding is suddenly closer than you think! Lovina has been busy sewing dresses for her and her daughters for a family wedding next week. This is the dress her daughter Verena will wear as a “table waiter,” or server, at the wedding meal. I need to take Joseph to his post-op checkup tomorrow. He still seems to be gaining back his health. The girls are making bacon, scrambled eggs, and toast for our supper. I should be helping, but wanted to get this column done so I can start sewing early tomorrow morning. Recently we picked up a lot of potatoes that the potato-picking machine missed from a neighbor’s field. They are not keepers, so we needed to get them used up. We shredded some of the potatoes to put in the freezer so that we can use them in casseroles later. This recipe is another good way to use them up. God’s blessings! Beat egg and milk. Combine flour and seasonings. Dip potatoes into egg-and-milk mixture. Dust with flour mixture. Place single layer on a baking sheet. Drizzle with oil. Bake at 450° for 20–25 minutes. Today is our youngest child Kevin’s ninth birthday. Has it really been that long? It was also the first day of school, so he was a tired little boy tonight. Daughter Verena baked a horseshoe-shaped cake for him today since I wasn’t home all day. He requested a horseshoe cake and wanted chocolate cake. 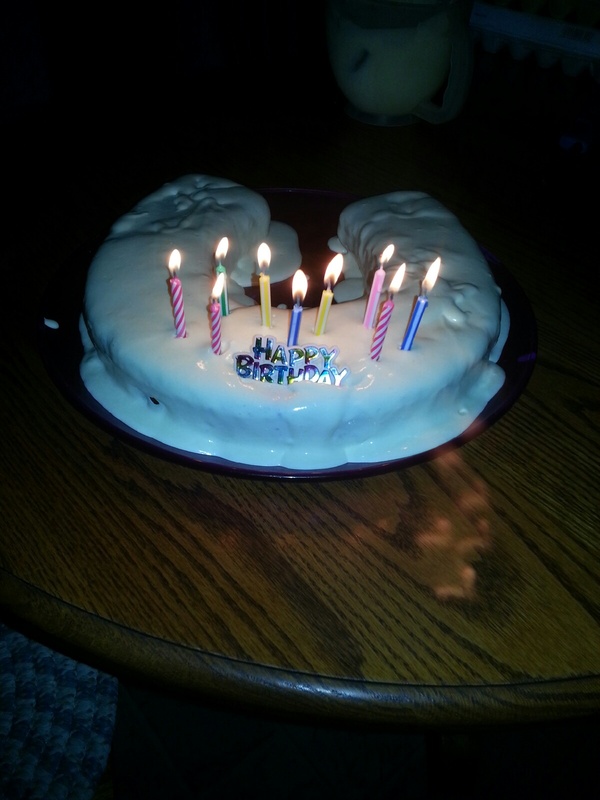 Lovina’s youngest child turned nine this week, and his older sister made him this horseshoe cake. Foremost on our minds is the sad news that Uncle Andy Coblentz, 81, passed away last night. He was the brother right after my dad in age. Dad would be 83 if he were still here. We are glad we were able to see Uncle Andy and Aunt Caroline at the reunion in July. Our sympathy goes to Aunt Caroline and cousins Andrea, Lori, and David, and also to all the grandchildren and great grandchildren. Our plans are to attend the funeral on Friday, which is over three hours from here. I’m sure Andy will be missed by many. May God be with them as they mourn for such a great man. Only God can bring us comfort in times like this. On Labor Day we had a very busy day. A few of the girls washed the laundry while the rest of us butchered 51 chickens. In four hours we had the chickens all cut up. We soaked the meat in ice water to cool off before bagging it for the freezer. These chickens were broilers, which one can eat fresh or freeze. They were six weeks old and weighed around three and a half to five pounds. We had over 180 pounds of meat total. What a blessing to be able to put it all in the freezer for later use. We appreciated the help of Timothy and Mose, which made everything go faster. We had an assembly line, with one guy chopping off the heads of the chickens and a few people plucking the feathers after they were dipped in scalding water. Then they were gutted, cleaned and cut up into pieces. The gizzards and hearts were also saved to clean. The wings were bagged separately to be grilled for hot wings. After butchering chickens, none of us are ready for a meal of chicken for a while! Sunday evening we had supper with sisters Verena and Susan, as brother Albert, Sarah Irene, and family were there. Albert’s married sons, Joe and Albert Jr., and their families were also there. Jacob and Emma’s children were also there, but Jacob and Emma couldn’t attend as Jacob wasn’t feeling good. We were served a good supper of barbecued chicken and all the trimmings. My husband, Joe, doesn’t have work this week. Today Joe and I and sisters Verena and Susan traveled to Berne, Indiana. We spent most of the day at sister Liz’s house, helping her clean for the upcoming wedding of their oldest daughter, Elizabeth. Sister Leah was also there. Sister Emma has church services at her house on Sunday, so she wasn’t able to go. It was enjoyable to work together again, but we missed Emma. Tomorrow I will go help Emma with preparations for church services. And like I don’t have enough to do, the peaches I ordered came today. Life gets too busy at times! Let us always take time for God. 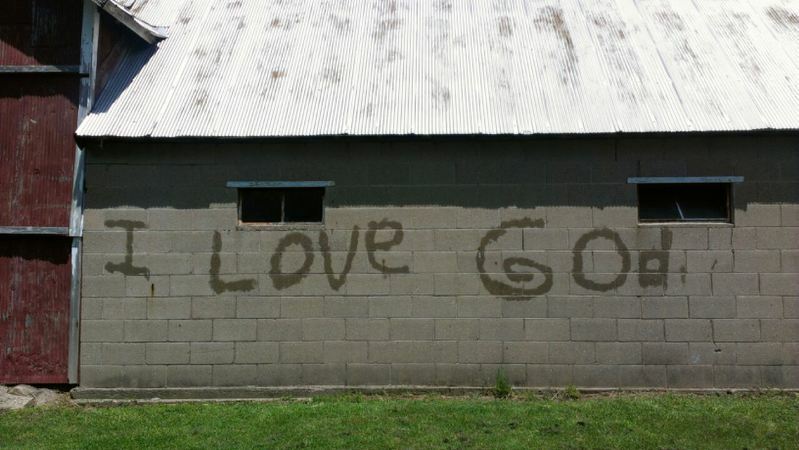 How easy it is to neglect God when we get busy. Joseph, who had two surgeries recently, seems to keep gaining strength every day. We are so happy for that. It is already 10:30 p.m. Everyone has gone to bed. I need to join them, but I knew I needed to write this column. Try this chicken biscuit stew sometime. Wishing you all God’s richest blessings! Melt butter and add flour, salt and pepper. Add milk to form a white sauce, stirring until thick. In a separate pan, boil potatoes, carrots and peas; drain. Add to white sauce and then add broth, chicken and onions. Put into 9×13 pan and top with unbaked biscuits. (You can use storebought biscuits in a tube or your own favorite biscuit recipe.) Bake at 375° for 20–25 minutes. Lovina Eicher is an Old Order Amish writer, cook, wife and mother of eight. Formerly writing as The Amish Cook, Eicher inherited that column from her mother, Elizabeth Coblentz, who wrote from 1991 to 2002. Readers can contact Eicher at PO Box 1689, South Holland, IL 60473 (please include a self-addressed stamped envelope for a reply) or at Editor@LovinasAmishKitchen.com. Sister Verena’s forty-eighth birthday was Friday, August 22. She recently had our family and Jacob, Emma and their family there in honor of her birthday. We enjoyed a pizza dinner. Sister Susan made a cake for Verena but then surprised her with an ice cream cake from Dairy Queen. 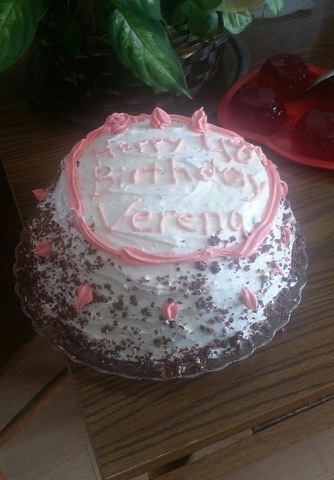 Lovina’s sister Susan made this birthday cake for their sister Verena last week. It has been over a week now since son Joseph’s surgeries. He seems weak yet, but he is getting better every day. We thank God for his many blessings! This past week we were busy canning and freezing sweet corn. We have a total of 41 quarts so far. My tomatoes are also producing really well. 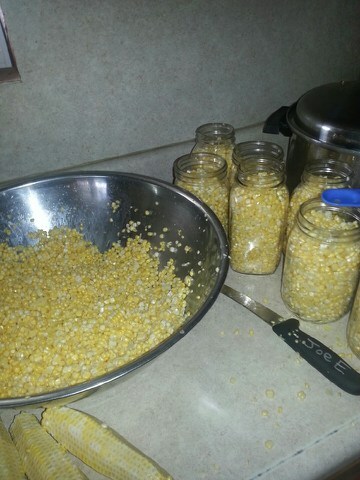 Some of the 41 quarts of corn that Lovina canned and froze last week. Sister Emma and Jacob will host baptismal services for a boy and girl in our church district in a few weeks. I was finally able to help her for a day last week. With Joseph not feeling well last week, it was hard for me to leave. Joe’s sister Christine and her husband, Jake, and their family let us know that they would be at the church services at niece Verena and Melvin’s house. We were unable to go, as Joseph was still not able to stay up that long. We were sorry we didn’t get to see them. They live in a small community two and a half hours north of here. We had surprise visitors Sunday evening. Joe’s sister Carol, Pete, and seven children came after supper. It was a hot evening so we all sat outside on our porch. The girls made popcorn and lemonade. Their family is planning to move to Tennessee, so we will not get to see them as often. School doors will open next week for our four youngest children. Half of our children are done with their school years. Unbelievable! This is Loretta’s final year. She will be in eighth grade. Joseph, 12, will be in sixth grade; Lovina, 10, will be in fourth grade; and Kevin will be in third grade. The first day of school, September 2, is Kevin’s ninth birthday. Kevin likes it better when I tell people that he is my youngest child than when I say he is my “baby.” He has grown up so much, but for some reason we don’t like to see time go so fast. One evening this week the boys and Lovina decided to build a top to cover our little wagon. They were hammering away in the pole barn. Finally they pulled it out so we could see. I think the wagon will be a little top-heavy, but I was amazed at their ambition and success. They were creative and had fun doing it. I’m not so sure if Joe appreciated his tools being scattered around, and I told Joseph he wasn’t allowed to be pounding nails because of his surgery. Something tells me he didn’t listen after I was out of sight. Once children start to feel better after being sick, it’s hard to keep them quiet! Joseph told me he wants to be a carpenter when he gets older. He said it is fun using a hammer. This week I will share my caramel cake recipe. I have had quite a few requests for it since I wrote about my sister Susan bringing one along when we went camping. Until next week—God bless! Set aside 1 cup cake mix for topping. Combine remaining cake mix, flour, oil, water and eggs. Beat well and then pour batter into a 9×13 cake pan. Mix until crumbly. 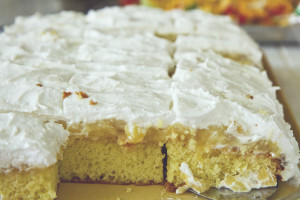 Sprinkle topping on cake and cut through batter with a knife to create a marble effect. Bake at 350° for 30 minutes or until done. Mix together and drizzle over cake when done. It is Sunday evening around 9 p.m. All is quieting down here at the Eicher homestead. Tomorrow looks like a busy day and this column needs to be in the mail. Son Joseph, 12, had surgery on Thursday to have his tonsils and adenoids removed. We arrived home by 4 p.m. and were thankful all went well. That night Joseph seemed very restless and wasn’t able to sleep for very long. Joe and I were up with him a lot trying to make him comfortable. Around 1 a.m. Joseph said that he felt like he had to throw up. Everything he threw up looked like blood, and there was a lot of it. I called the local emergency room and talked to a doctor, wondering what we should do. The doctor said to wait and see if he did it again, and that if he didn’t all should be fine. Around 5 a.m. daughters Elizabeth and Susan were getting ready for work and I was packing son Benjamin’s lunch. Joseph started throwing up blood again, so we called a friend to take us to the hospital. I was so glad Joe didn’t have to work and was home to go with me. While Joe was helping Joseph out to the van, Joseph passed out. That scared us even more. The doctors checked him out and took some tests. He had a big blood clot on the incision and was badly dehydrated. They decided to transfer him to a bigger hospital an hour away by ambulance. Surgery was scheduled for as soon as we arrived. How thankful we were, after waiting and not knowing what to expect, when the doctor came to tell us that the surgery went well and they were able to remove the blood clot and repair the incision. He lost quite a bit of blood but they thought he would be fine without giving him some blood. They kept him on an IV to get some fluids in him. We were so happy that we could bring Joseph home again the same day. He felt a lot better that evening but I had to give him his medication around the clock. He slept lots better that evening but was still very weak. Saturday morning we had an easy breakfast as my friend Ruth brought a blueberry French toast casserole ready for the oven. What a treat! 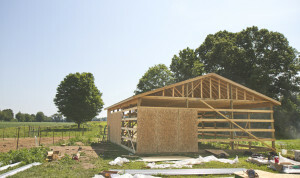 Timothy (Elizabeth’s friend) is in the process of having a pole barn put up on his property. He is doing all the labor with the help of family and friends. Saturday he had quite a few that came to help. The rafters and roof, along with the plywood around the outside walls, were all put on. The men and boys accomplished a lot in a short time. Some of the women came along and some sent food with their men. By the time all the food was on the table, there was more than plenty. Joseph was able to come for a while. He isn’t allowed to ride in the buggy yet but Ruth brought him with her car and took him back home later. He was glad to be able to come see what’s going on, and said he wished he could be hammering on nails with all the other boys. Trials like Joseph’s scare us but there is a God we can turn to for comfort. I often wonder how we would survive without His guiding hand. May God bless each of you! I will share Ruth’s recipe for blueberry French toast casserole. I am usually not a blueberry fan but I did like this. Lightly grease a 9×13 baking dish. Arrange half the bread cubes in the dish and top with cream cheese cubes. 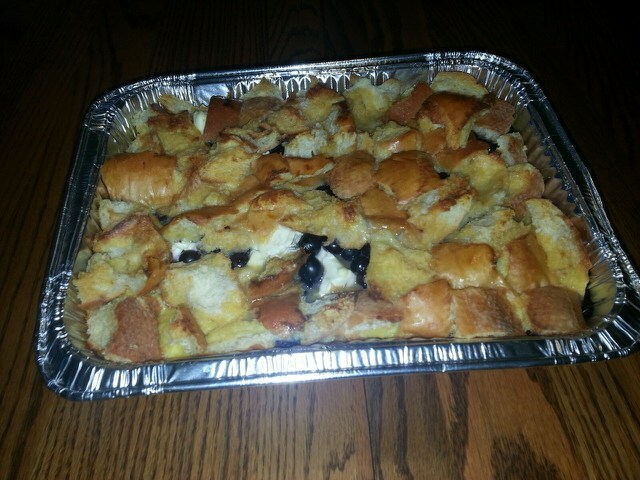 Top with blueberries and remaining bread. In a large bowl, mix egg, milk, vanilla and syrup. Pour over the bread cubes. Cover and refrigerate overnight. The next morning, remove from refrigerator 30 minutes before baking and preheat oven to 350°. Bake covered for 30 minutes, then bake uncovered for another 25-30 minutes or until center is firm and lightly browned. In a saucepan, mix sugar, cornstarch and water. Bring to a boil, stirring constantly, and cook for 3-4 minutes. Mix in remaining 1 cup blueberries. Reduce heat and simmer 10 minutes until blueberries burst. Stir in the butter and pour over casserole. Lovina Eicher is an Old Order Amish writer, cook, wife, and mother of eight. Formerly writing as The Amish Cook, Eicher inherited that column from her mother, Elizabeth Coblentz, who wrote from 1991 to 2002. Readers can contact Eicher at PO Box 1689, South Holland, IL 60473 (please include a self-addressed stamped envelope for a reply) or at Editor@LovinasAmishKitchen.com. Canning season is in full swing. 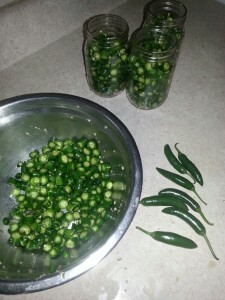 This past week we canned hot peppers (Serrano), dill pickles and salsa. I have a lot more tomatoes that need to be used, and I still have plenty of tomato juice, so I will make more salsa. What a blessing to be able to fill all those empty jars again. Last week Lovina canned Serrano peppers, which are up to five times hotter than jalapenos! We now have the rest of our little chicks. We had 75 of them for two weeks and now 25 more layers came. We will butcher the 50 butchering chickens in several weeks. The other 50 will be laying hens. Once they start laying eggs we will butcher our old laying hens for chicken broth. That is always a big job! In our community, which isn’t very big, there are five or six weddings coming up in August and September. So bear with me if I am talking a lot about weddings lately! We have three wedding invitations on our refrigerator right now. Daughter Elizabeth’s friend Marietta will exchange vows with Enos on August 28. We were surprised to receive an invitation. Elizabeth and Timothy will be tablewaiters at their wedding. It is a little over two weeks away, and Elizabeth still needs to sew her dress for the wedding. Yesterday Paul and Edna were published to be married on September 24. When a couple is published for marriage, the bishop announces it in front of the church. Until then it is usually kept secret, with only family members and close friends knowing about it. We are invited to this wedding as well. And we have niece Elizabeth and Samuel’s invitation on there for September 19. The youth are usually invited to a 7 p.m. supper at all of these. It’s hard to believe Marietta will be getting married. It seems like she and Elizabeth were just young school-age girls! They had a lot of fun times together, along with friends Linda and Freda. Many nights when they stayed here for the night, I wondered if they ever slept. Now they all have special friends, and Marietta is getting married. All four girls are 20 years old or will be soon. Life goes on! Son Joseph, 12, will have surgery this week to have his tonsils and adenoids removed. I hope everything will go okay. My husband, Joe, is working four-day weeks at the RV factory. This week he will only work three days so he can be at the hospital when Joseph has his surgery. Elizabeth, Susan and Benjamin all left this morning for their jobs. Benjamin is helping Susan’s friend Mose at his saw mill. He enjoys it! 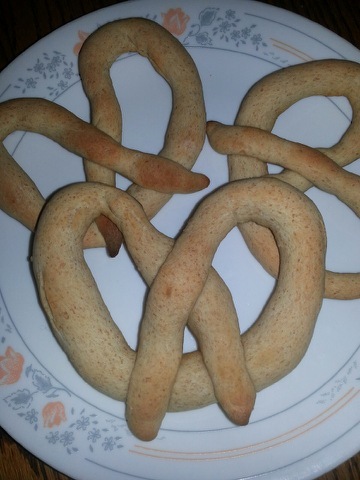 Soft pretzels, made by daughter Elizabeth, were the treat at Lovina’s house this week. This week I will share a recipe for soft pretzels. Elizabeth asked her friend LeAnna for the recipe and made them one night. We enjoyed them with hot cheese sauce. Dissolve yeast in warm water. Add butter, brown sugar and salt. Mix well. Add wheat flour and mix thoroughly. Add enough all-purpose flour to make a soft, elastic dough (you may not need all of the flour). Knead for 10 minutes and then let rise 30 minutes. Roll pieces into 12–18 long ropes, and twist each into a pretzel shape. Place on well-greased cookie sheet. Bake immediately at 450 degrees for 10–15 minutes or until golden brown. Dip in melted butter and sprinkle with pretzel salt. Makes 12–18 soft pretzels. Options: You can brush on the melted butter to save on butter. Serve with hot cheese sauce. Lovina Eicher is an Old Order Amish writer, cook, wife, and mother of eight. Formerly writing as The Amish Cook, Eicher inherited that column from her mother, Elizabeth Coblentz, who wrote from 1991 to 2002. Readers can contact Eicher at PO Box 1689, South Holland, IL 60473 or at Editor@LovinasAmishKitchen.com. August is well underway, and 2014 is more than half gone. Time just goes faster and faster. It is just amazing how the years go one after another. What matters most is that we live our lives pleasing to God. The world is full of temptations and we as parents need to pray daily that God will guide our children in the direction of His will. Thursday turned out to be a beautiful day as niece Marlene and Chris exchanged their marriage vows. 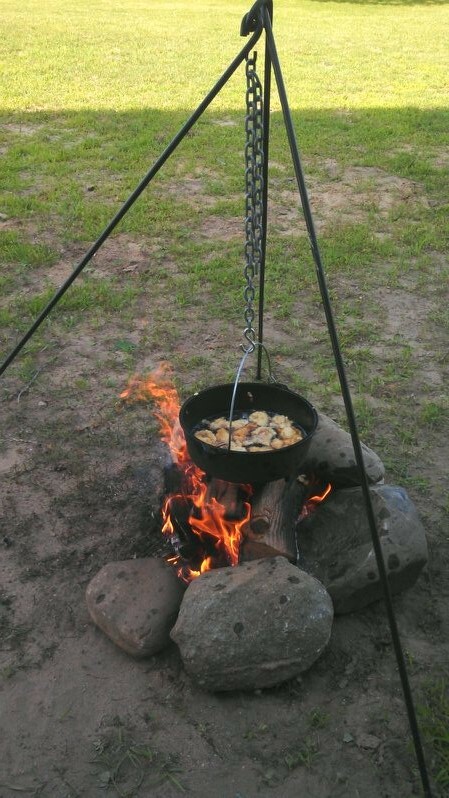 Three hundred and fifty pounds of chicken was fried for the noon meal. Also on the menu were mashed potatoes, gravy, chicken and noodles, dressing, lettuce salad, mixed vegetables, cheese, homemade wheat bread, butter and strawberry jam. Desserts were tapioca pudding, sliced peaches in a fruit glaze, angel food cake with a strawberry topping, and the pies were pecan, blueberry and cherry. Sausage links were also added to the menu for supper. “Nothings” (also called “Knee Patches”) were on the tables. They are a thin, sweet pastry made from eggs, flour, sugar and cream. The dough is rolled out real thin and then deep-fried. Sugar is sprinkled on top and they are put on stacks on a dinner plate. Plates of Nothings are set around the tables and people can enjoy them all day. 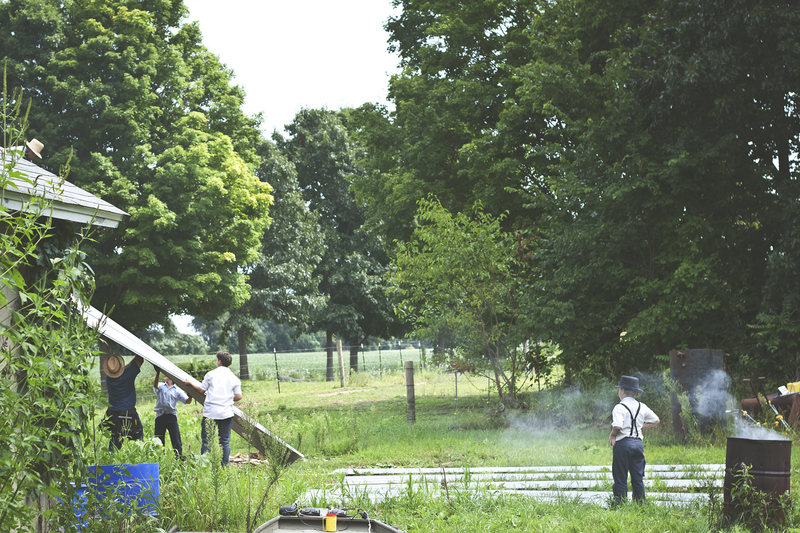 In our Amish community Nothings are never made for weddings. When I was a young girl everyone in my home community had Nothings and celery sticks on the tables at a wedding. They didn’t have celery sticks at this wedding, so I’m not sure if this isn’t a tradition anymore or if some just decide not to have celery. Stacks of “Nothings,” shown here at Lovina and Joe’s wedding in 1993. They didn’t have a wedding wagon there, so kerosene stoves were borrowed as well as many pots and pans. 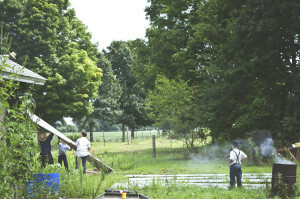 The food was all prepared in a summer kitchen area that connected to the pole-barn type building where the tables were set up. In yet another building the services were held for the wedding ceremony. Brother Amos and Nancy have eight daughters and two sons. This was the fourth daughter getting married so I’m sure they are well practiced to prepare for a wedding. I was a cook at the wedding and my job was to help mash potatoes. All the potatoes were mashed by hand. In some of the wedding wagons they have mixers that are run off the generator so it makes lots less work to get the potatoes mashed. This was how the potatoes were mashed at niece Irene’s wedding. It is always interesting to see the differences from one Amish community to the next. At weddings in our Amish community all the children go to the table to eat. At weddings in Berne, Ind., they have the children eat cafeteria-style. At this wedding, 130 adults could eat at one time and the tables were reset quite often. I’m guessing there were around 250-300 youth that came for the evening meal. Berne is a large community compared to ours. We were happy to have nephew Chris Schwartz Jr. spend the evening here on Saturday. We cooked supper outside on the grill and open kettle. Pork steak, ribs, hot wings, and banana and Jalapeño poppers were grilled. Chili soup was made in the kettle. Chris is 30 years old and still single. He runs a construction crew and was working close by. Blueberries will only have a short season here in our area this year. Try this blueberry pie with fresh blueberries. Use fresh, ripe blueberries or unsweetened frozen blueberries. Wash and drain. Combine sugar and Clear Jel in a saucepan. Add water and food coloring (optional), then cook until mixture thickens and begins to boil. Add lemon juice and boil 1 minute, stirring constantly. Fold in berries and put in pie crust. 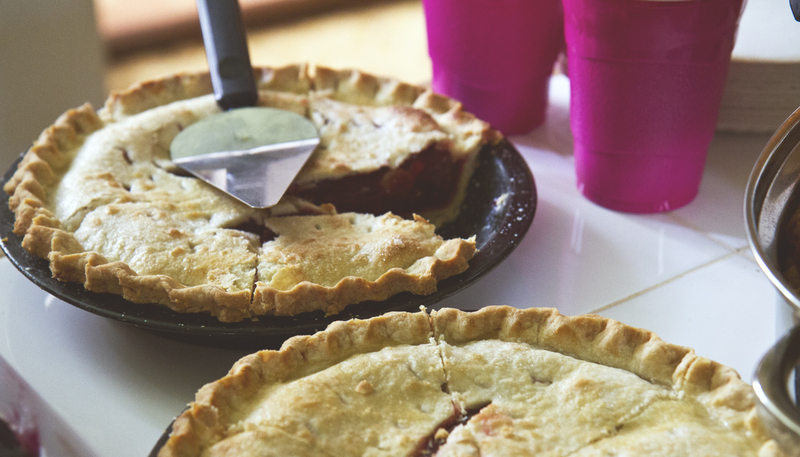 You can do either a double or single crust pie, and some use flour or minute tapioca instead of Clear Jel. Bake 1 hour or until done. We are having all kinds of garden goodies lately. It makes meal planning so much easier. Our first batch of sweet corn is ready. We’ve also been enjoying tomatoes, green beans, buttered red beets, zucchini, cucumbers and hot peppers. 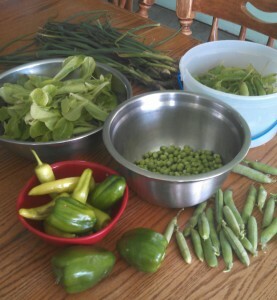 The peas are now over for the season. 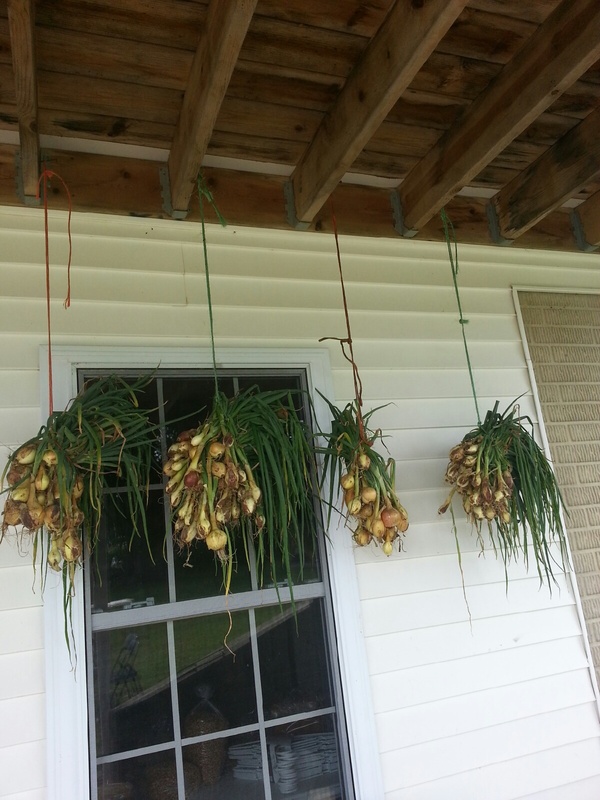 Onions hang to dry on the porch. The boys pulled all the onions from the garden and we tied them in bunches to hang under the porch to dry. Before it gets too cold we will move them to the basement. I hardly ever have to buy onions from year to year if I plant enough to store for the winter. We also like to plant enough potatoes but this year they didn’t do so well. I’m surprised if we will have enough for storage. There is a potato field close by, where we can go pick up potatoes after the picker goes through. They miss a lot and it’s easy to get plenty from the ground. This Thursday we plan to travel to Berne, Indiana, to attend niece Marlene and Chris Troyer’s wedding. Daughter Elizabeth has almost completed sewing her periwinkle-colored dress for this occasion. Elizabeth and her friend Timothy will be table waiters and I’ll help cook. More on that next week. Congratulations go to niece Elizabeth and Sam as they announced their wedding plans for September. This would be sister Liz’s oldest daughter and the first wedding to prepare for. Liz has a wedding wagon she rents out to people so she should be well prepared with all the tables, stoves and dishes that she will need for the wedding. For my own wedding my mother had to borrow stoves, pots and pans, and some dishes—as wedding wagons were unheard of then. It was a lot of work to gather these things and then make sure everything was delivered back to its owner. 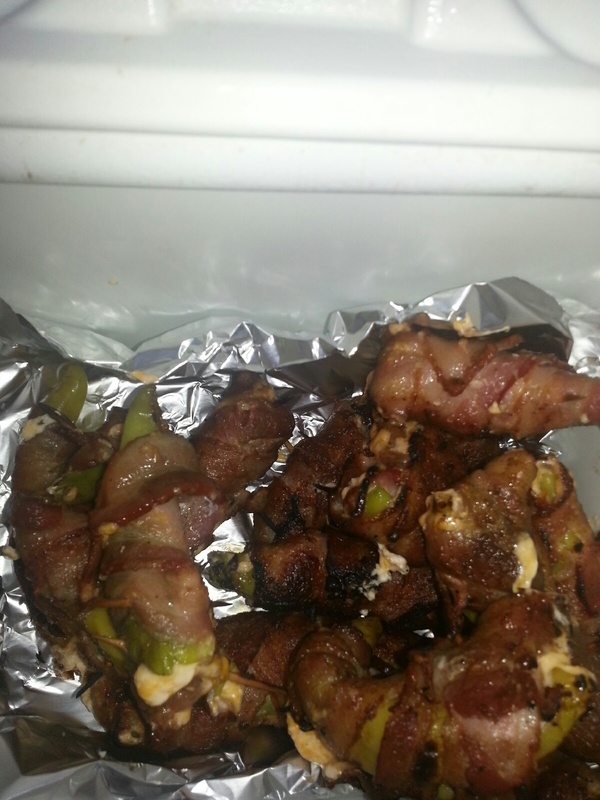 We are enjoying making banana poppers on the grill lately since our banana peppers are big enough to stuff with cream cheese and shredded Colby cheese. 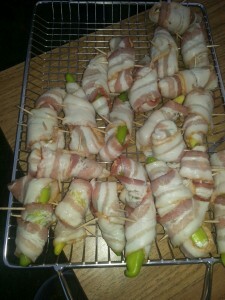 We then wrap bacon around the peppers and grill them. We make a few with jalapeños for Joe and me but the children prefer the banana peppers as they aren’t quite as hot. It seems like the banana peppers can’t grow fast enough to keep up with making the poppers. 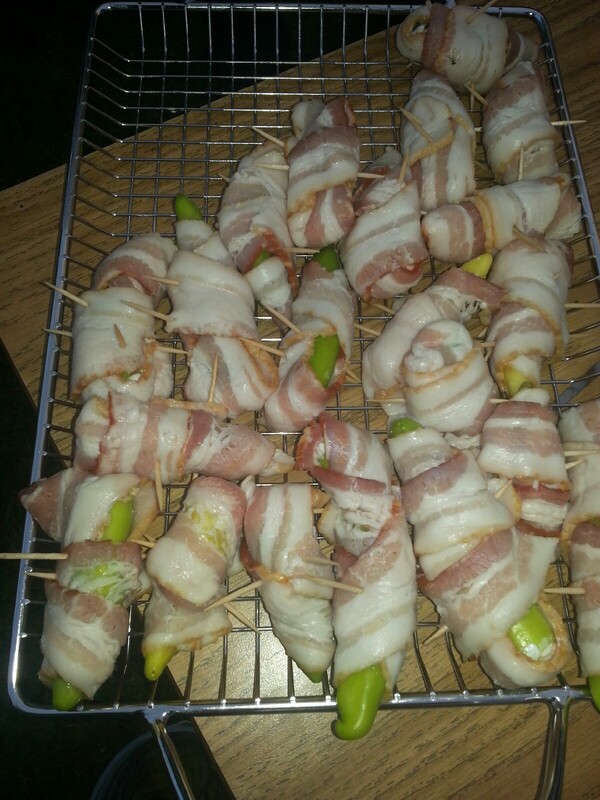 Banana peppers stuffed with cream cheese and wrapped in bacon. This is just before putting them on the grill. Son Kevin, 8, loves to husk the corn for me when we have sweet corn. I thought it was funny when he asked where he should put the wrappers when he takes them off. He was talking about the husk. Son Joseph, 12, had four of his school buddies here for the night on his birthday, July 24. They slept out in a tent in our backyard. I think they told each other so many scary stories that they were a little scared to go to sleep. They came in and told me they saw eyes in the barn. After investigating, it happened to be our dog Rover. At 5:30 a.m. they all moved up to the boys’ bedroom as they said it was getting really cold sleeping in the tent. We had 54 degrees that morning, unusually cool weather for July. Joseph wanted cupcakes instead of cake for his birthday. Daughter Verena, 16, baked chocolate and white cupcakes for him. 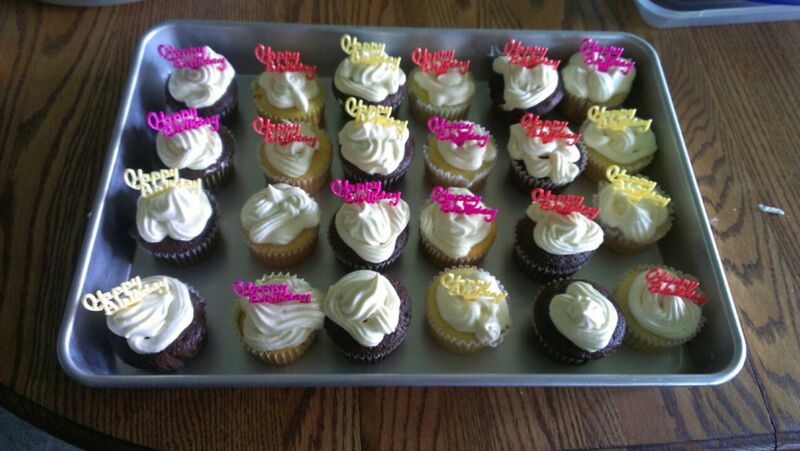 She topped them with vanilla pudding frosting. Chocolate and vanilla cupcakes for Joseph’s birthday. To make the frosting, add 1 box instant vanilla pudding to a container of Cool Whip. I want to thank all of you readers that have taken time to encourage me to keep writing. Life brings us disappointments in various ways. Being honest in all things and letting God be our guide is such great advice. Until next week, God bless. Cook green beans until tender (or use canned beans). Chop onion and sauté in 2 tablespoons butter. Slice or dice eggs and mix with the beans. 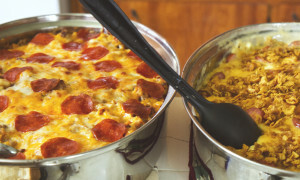 Pour beans, eggs, and onions in 1½ quart casserole dish. Pour mushroom soup over all. Toast bread crumbs in 1 tablespoon butter. Sprinkle casserole with cheese and toasted bread crumbs. Bake 40 minutes at 350°. Such a lovely July morning. My wash and wringer machine is working again now, and it would be a great laundry day but we don’t have any hot water. A service man will come out this morning to look at our gas water heater. Hopefully after he gets it going there will still be time to do the laundry. Daughter Lovina, 10, said, “Mom why don’t you heat the water on the stove like Aunt Liz does?” We had just visited Liz in Berne, Ind., and Liz does not have indoor plumbing like we do. Lovina had noticed that when we were there and went to wash her hands at the sink, asking, “What happened to their faucets?” We had to laugh. Lovina was born here in Michigan and never knew how life was when we lived without indoor plumbing in Berne. Last week was full. On Monday, sister Emma and I went to help bake pies for niece Irene’s wedding. Tuesday the 15th was Joe and my 21st anniversary and also brother Albert’s 50th birthday. Albert has two sons, Albert Jr., 22, and Andrew, 11, that also share his birthday along with a daughter-in-law born that day. Wednesday was nice and cool for the wedding of Levi Jr. and Irene. Three hundred pounds of chicken were grilled for the noon meal. 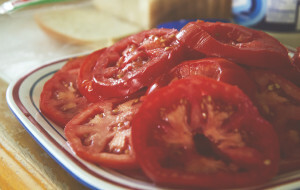 Also on the lunch menu: homemade bread, butter, strawberry jam, mashed potatoes, gravy, noodles, dressing, mixed vegetables, lettuce salad, cheese, cheesecake, mixed fruit, along with peach, Bob Andy and peanut butter pies. Candy bars were passed around at the end of each meal for a later snack. The supper menu was the same except there was poor man’s steak instead of chicken, and ice cream. My job was to help make the gravy. For each meal we made five 8-quart kettles of gravy. All the food was prepared in the wedding wagon. The wedding wagon is powered by generators so we have two sinks with hot and cold running water and seven gas stoves. It is so much easier than how we had to get things around for my wedding. The wedding wagon comes with place settings for 350, tables, and a walk-in cooler. Tables were set up in a big building and 350 were seated at one time to eat. Saturday we traveled to Berne, to attend the Albert and Verena Coblentz (my late grandparents) reunion. Grandpa and Grandma had 13 children. My Dad and his three sisters have passed away and are greatly missed. There are nine brothers living, and we were happy that all nine were able to attend. Relatives gathered from at least six states: Indiana, Michigan, Mississippi, Wisconsin, Missouri, and Arizona. We had a silent auction at the reunion. It was fun to see who won the bidding at the end of the afternoon. The last time we attended this reunion was 2004 so it was very good to be in attendance again. Sister Emma had her 41st birthday on Saturday so all the Coblentz’s sang “Happy Birthday” to her. 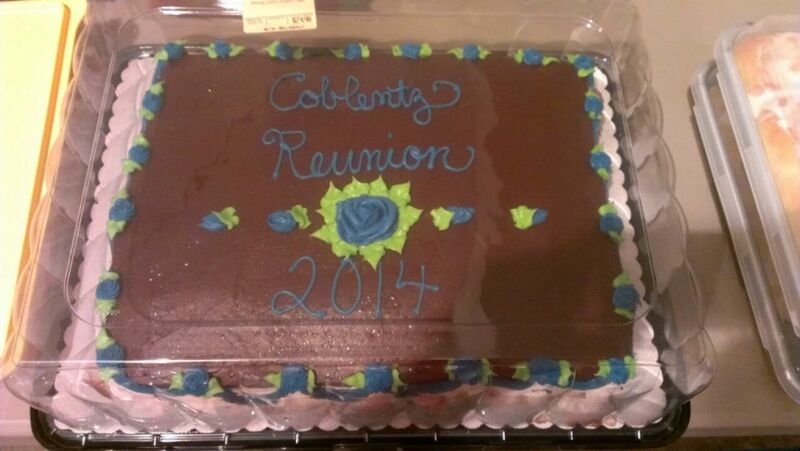 One of the cousins had decorated a nice Swiss-roll cake with “Coblentz Reunion 2014” written on it. There was so much food that I won’t even try to list it. Aunt Frances and Uncle Joe’s house and belongings were sold the same day, which I can imagine was sad for their children. I remember the sad feeling when we had to do that. We attended the auction for a while before heading to the reunion. Cousin Jane and Greg bought the house so it’s nice that it will stay in the family. Yesterday we had dinner at sister Emma and Jacob’s house. In honor of Emma’s birthday we ate pizza, salad, veggies, ice cream, chocolate cake, and strawberry pie. 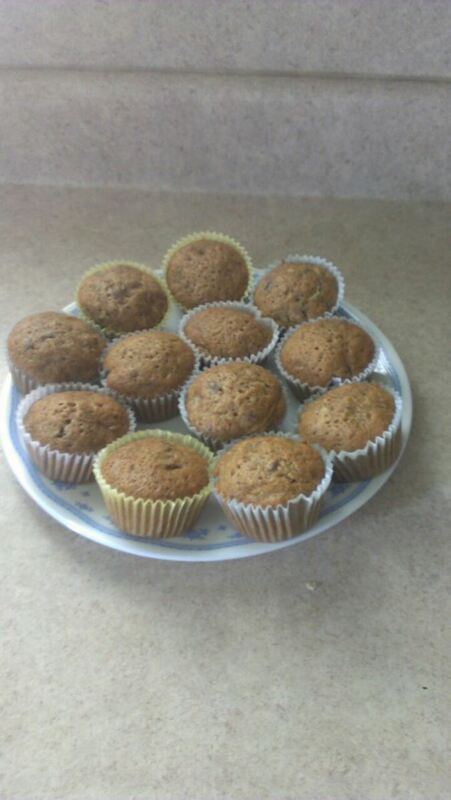 Try this recipe for zucchini nut muffins. Although my zucchinis aren’t quite ready, we are enjoying some from my sisters Verena’s and Susan’s garden. Combine flour, baking powder, baking soda, salt, and cinnamon in a large bowl. Set aside. In another large bowl combine sugar and eggs. Beat for 2 minutes. Gradually add oil and keep beating constantly for 2 minutes. Stir in vanilla, zucchini, and nuts, then fold in dry ingredients just until moistened. Spoon into greased muffin cups two-thirds full. Bake at 375° for 20 minutes or until done. All is quiet here at the Eicher household. Everyone has retired for the evening. I will be glad to join them, but I can’t neglect the duty of getting this column ready for the mail tomorrow. I will leave early to go help bake pies at brother Albert’s house. Albert and Sarah Irene’s daughter, Irene, is getting married to Levi Raber on Wednesday. I will be a cook at the wedding, so some of us go to help prepare whatever needs to be done and bake pies. I still need to sew my cape and apron for the wedding. I finished my dress. Daughter Elizabeth and her friend, Timothy, are table waiters and Elizabeth has to wear the color berry. She has her outfit all sewn. 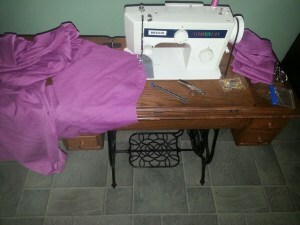 It’s such a help to me that she can cut out and sew her own dress, cape, and apron. On July 31 another of my nieces is getting married. Brother Amos’s daughter Marlene is getting married to Chris Troyer. This wedding will be in Berne, Indiana. I was asked to be a cook, and Elizabeth and Timothy are table waiters again. Elizabeth will have to wear a periwinkle-colored dress for this wedding. Marlene chose the same dark blue color for the cooks as Irene did. That will make less sewing for me. We were invited back to the place where church was held at today for supper. We decided to just stay home. It was a relaxing evening with all the family home and Timothy and Mose were here as well. Joe and our three sons, Timothy, and Mose played a few games of croquet. The girls aren’t very fond of playing that game so all five daughters went for a walk. For supper, I made an Italian sausage and potato casserole, and also a garden salad with fresh lettuce from our garden. I will share the casserole recipe at the end of my column. Sisters Verena and Susan shared this recipe with me that a friend had given to them. I like trying something different, and it was a winner in the family as most of it was eaten up. There was just enough for Joe’s lunch for tomorrow at work. 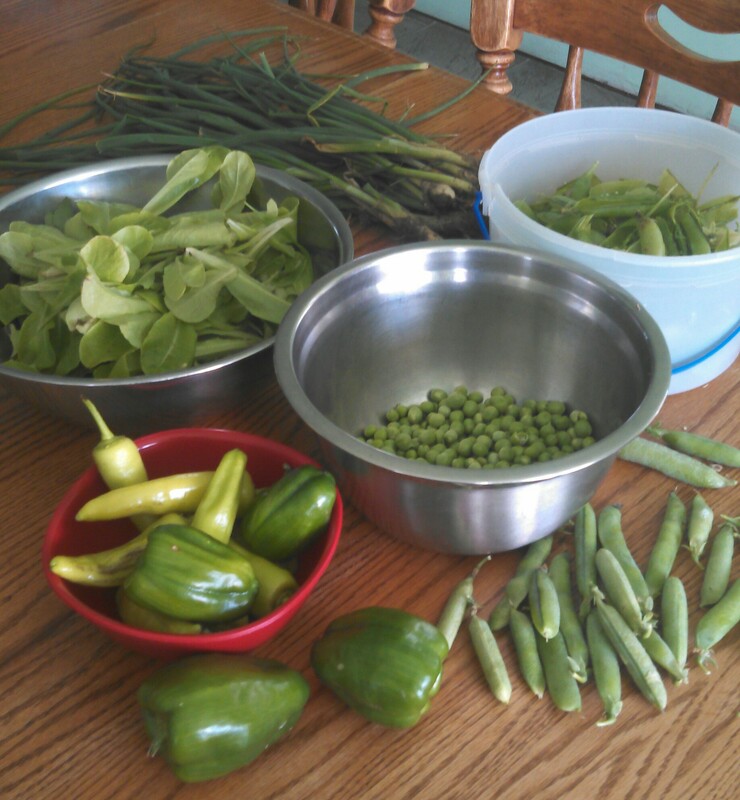 Fresh veggies from the Eicher family garden. The girls did the chores for sisters Verena and Susan from Wednesday to Saturday. They went on a sight-seeing tour to Niagara Falls with a busload of their friends. There were 42 girls in all on the bus. It sounds like they had a nice trip. On Friday while we were washing the laundry the wringer stopped working. We have a spare wringer when something like this happens, and guess what—the last time my wringer broke we laid it aside, never taking time to take it to be fixed. So there we were without a wringer and halfway through the washing of our clothes. Luckily, I have a spinner to help spin water out of the clothes but it was still a chore to wring all those clothes out by hand. Sisters Verena and Susan do not have to work tomorrow and said the girls could bring the clothes over to wash at their house. Since I’m leaving they might just do that. I’m not sure how quickly our washing machine will be in working order again. We had to take the washing machine to get it checked out as well, as Joe thinks it could be the gears in there instead of the wringer. We were excited to hear that we are uncle and aunt again. Joe’s brother, Benjamin, and Miriam from Sugarcreek, Ohio, were blessed with a little girl, Victoria Joy, recently. We look forward to meeting her. Mix sliced potatoes, onion, green pepper, and seasonings with olive oil. Bake in a 9 x 13 pan, covered, for one half hour at 350°. Remove from oven and drain, if necessary. Cut sausage in pieces and add to potato mixture. Continue cooking for one hour or until sausage is done.